This manual is divided into major Groups, Sections, and Paragraphs as explained below. The purpose of this arrangement is to bring related subjects closely together in accordance with the usual methods of performing service operations, and consequently to present information in a logical and easily understood order. Any desired subject in this manual may be located by reference to the alphabetical index at back of manual. Any desired subject also may be located by turning to the first page of the appropriate Group where contents of the Group are listed. Where the Group is divided into Sections the first page of each Section lists the contents of the Section. GROUPS. The manual is divided into the consecutively numbered major Groups shown on the preceding title page. To locate the first page of a Group, bend the manual until the black tab on first page of group can be seen in line with the Group title on title page. The first page lists the contents of the Group. SECTIONS. Large Groups are divided into appropriate Sections as shown on first page of the group. Sections bear the Group number and letters A, B, C, etc., in alphabetical order. The first page of each Section lists the contents of section. PARAGRAPHS. Each Group is divided into appropriate Paragraphs which are numbered consecutively within the Group, whether or not the group is divided into sections. Paragraph titles and page numbers are listed on the first page of each Section if used, or on first page of the Group if sections are not used. SUB-PARAGRAPHS. Where necessary for clarity, or distinction between models, Paragraphs are divided into appropriately titled Sub-paragraphs. These are usually lettered in alphabetical order within the paragraph. PAGE AND ILLUSTRATION NUMBERS. Pages and illustrations are numbered consecutively within each Group. The number consists of the Group number followed by the Page or Figure number. Page numbers are printed in the upper outer corners of all pages. The small folio numbers at inner edges of pages are for printer’s use only and are not used for reference in the manual. CROSS REFERENCES. All references to information in other parts of manual are made by Paragraph Number, to avoid the necessity of first referring to the alphabetical index for location. Paragraph references are usually given in parentheses, for example: (par. 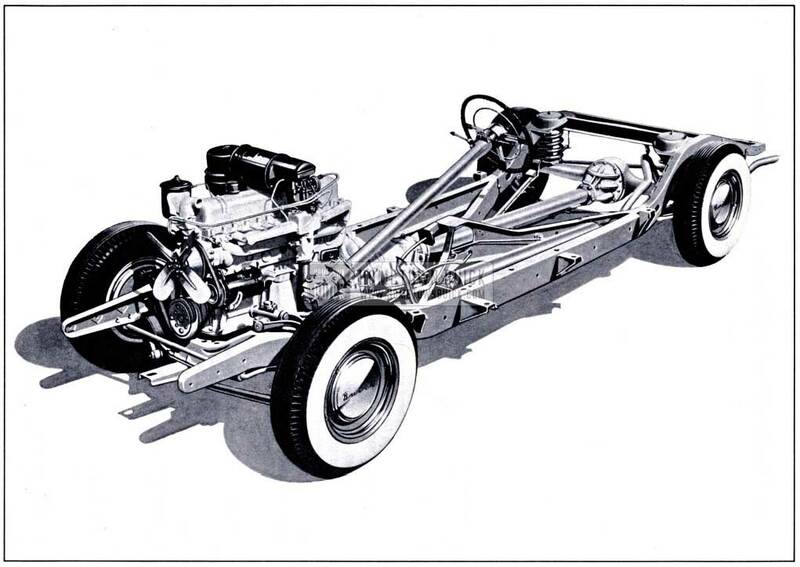 6-15) refers to the 15th paragraph in Group 6, “Chassis Suspension”. SERVICE BULLETIN REFERENCE. Space is provided on first page of each Section (or single section Group) for insertion of a reference to any B.P.S. bulletin which relates to the subjects covered by the section. SPECIAL TOOLS. Unless otherwise indicated, all special tools identified by tool numbers in the manual are available through Kent-Moore Organization, Inc., General Motors Building, Detroit 2, Michigan. NOTE: References to Series “44” have been crossed out where printed, because this series was eliminated after the type was set but before 1951 production started. The car serial number is on a plate attached to the body on left front door hinge pillar and is also stamped on the left frame side rail near brake master cylinder. The first digit of serial number indicates where car was built: 1 = Flint, 2 = Southgate, 3 = Linden, 4 = Kansas City, 5 = Wilmington, 6 = Atlanta, 7 = Framingham. The engine serial number is stamped on a boss on right side of crankcase below push rod cover-forward of distributor on Series 40-50 and near rear of crankcase on Series 70. The last digit of engine number indicates the series: 4 = Series 40, 5=Series 50, and 7 = Series 70. A stamped dash (-) about 1/4″ long directly following the engine serial number indicates a .010″ O.S. production engine. 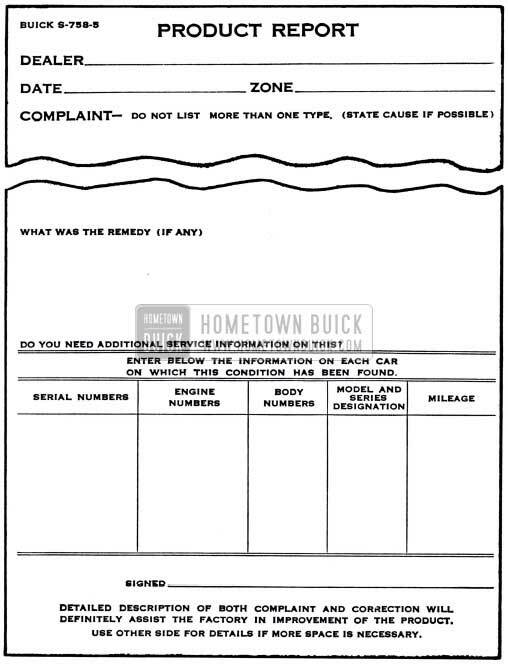 Product Report Form S-758-5 is furnished to all Buick Dealer Service Departments to enable them to report product difficulties. These forms should be filled out in triplicate and forwarded to Zone Offices each week. Zone Offices forward the reports to the factory where the Engineering and Inspection departments analyze them and use the information to improve product quality. Unless a Product Report is made on every product difficulty each time it occurs it is impossible for the factory analysis to be correct and valuable time will be lost in effecting a correction. Dealer Service Departments are repaid indirectly for time spent on these reports since they enable the factory to build the product so as to require the minimum of service when cars are received by the dealer. Dealer Service Department cooperation in supplying Product Reports is definitely appreciated by the factory. “The Manufacturer warrants each new motor vehicle, including all equipment or accessories (except tires) supplied by the Manufacturer, chassis or part manufactured by it to be free from defects in material and workmanship under normal use and service, its obligation under this warranty being limited to making good at its factory any part or parts thereof which shall, within ninety (90) days after delivery of such vehicle to the original purchaser or before such vehicle has been driven 4,000 miles, whichever event shall first occur, be returned to it with transportation charges prepaid and which its examination shall disclose to its satisfaction to have been thus defective; this warranty being expressly in lieu of all other warranties, expressed or implied and all other obligations or liabilities on its part, and it neither assumes nor authorizes any other person to assume for it any other liability in connection with the sale of its vehicles. “This warranty shall not apply to any vehicle which shall have been repaired or altered outside of an authorized Buick Service Station in any way so as in the judgment of the Manufacturer to affect its stability and reliability, nor which has been subject to misuse, negligence or accident. The Manufacturer has reserved the right to make changes in design or add any improvements on motor vehicles and chassis at any time without incurring any obligation to install same on motor vehicles and chassis previously purchased.